a transparent colored material to color light coming from a conventional lighting fixture such as a PAR Can. Modern gels are thin sheets of polycarbonate or polyester, placed in front of a lighting fixture in the path of the beam. 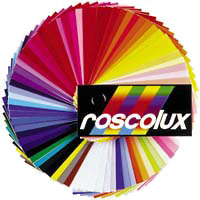 The two primary providers of lighting gels are Roscoe and Lee.